In Rock Island’s early years, it seems that there was a bank (or two) at every downtown intersection. 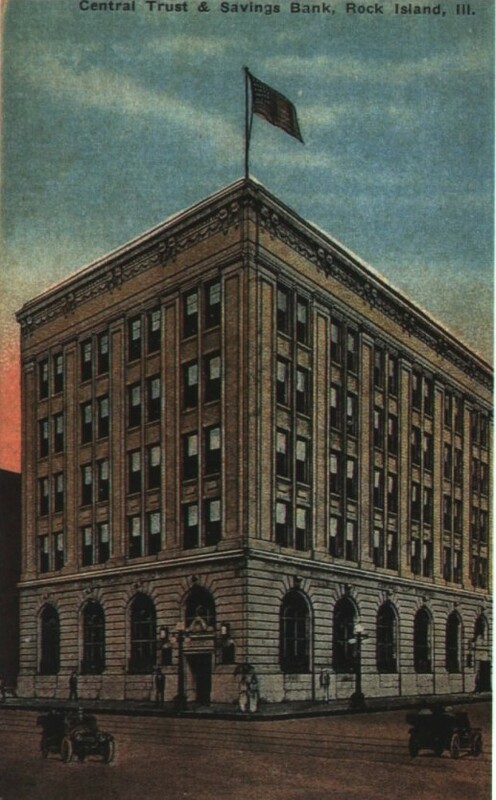 This postcard shows one of the finest bank buildings constructed in our area. Even today, it looks a great deal as it did when it was built in 1914 on the northwest corner of Eighteenth Street and Third Avenue for the Central Trust & Savings Bank. Central Trust was established in 1899, sharing quarters with the Rock Island National Bank, which had been organized in 1871 under the leadership of its first president, Captain T. J. Robinson. Both banks had their offices on the ground floor of the nearby Robinson Building at the north end of the block at Second Avenue. But by the time Central Trust constructed this new building, it was calling itself the “successor” to Rock Island National Bank. The postcard shows the Central Trust bank shortly after it was completed. Notice the strong horizontal joints of the stonework at the street level and the vertical rows of windows or bays that rise to the richly ornamented cornice. Central Trust only needed a relatively small portion of the space in its new $122,000 building. What about the upper stories? The bank immediately began advertising its new home as “the most up-to-date office building in the Tri-Cities” with “all the latest of modern improvements.” Finally, the clinching argument for potential tenants was probably, “An office in this building makes business a pleasure.” Who could resist? Not the doctors, attorneys, architects, dentists, and other professionals who rented the space – and continue to do so. Central Trust absorbed another local bank in 1926, which created a need for more space. So the postcard building was enlarged to 6 ½ bays on Third Avenue, increasing it from the four-bay width shown. The construction is so seamless that even looking closely it is virtually impossible to tell where the addition begins. A new entrance at the far west was included in the extension. That entrance is still used. The length of that closing is not known, but it was brief. In 1932, three local banks merged. The union of Central Trust & Savings, Rock Island Savings Bank, and Manufacturer’s Trust & Savings was called Rock Island Bank and Trust Company with headquarters in the Central Trust building. The new bank was stable and served the community for decades. In very recent years as many banks and their buildings have gone from local to national ownership, the old Central Trust and Rock Island Bank became Mercantile Bank, then Firstar, and currently US Bank. The main change in the bank exterior over the years is its windows. The double hung sashes of the upper windows were replaced with “modern” tinted sashes in three horizontal panels. The first floor windowsills were lowered significantly and the multipaned windows were replaced with large sheets of tinted glass. Lowering of the sills was an effective way to make the building appear more accessible. In pre-insurance days, banks liked to appear as a secure fortress, ensuring the safety of the wealth within. In 1947 the bank proudly announced background music in the form of canaries. Six canaries, reportedly of the same stock as sang at the prestigious Edgewater Beach hotel in Chicago, were placed throughout the bank. Four birds were suspended from the balcony, one in the safety deposit area and one in the president’s office. This may have also been the era when a large “front” entrance on 18th Street was added. Two of the six bays there were incorporated into a single large entrance. We can hope that much of the original stonework is intact under the large sign. This article by Diane Oestreich is slightly modified from the original, which appeared in the Rock Island Argus and Moline Dispatch on June 9, 2002.